Hi, I’m Doctor Karlie Moore. I give firefighters the tools they need to improve their physical health and start leading the life they’ve always wanted, at work and at home. If this sounds good to you, get on my mailing list for FREE health tips. My work with firefighters began in 2007 while working on my masters degree. I worked for a company that conducts police and firefighter fitness tests for over 30 departments in southern California. I enjoyed the job immensely. I left SoCal to pursue my PhD in Exercise Science and Nutrition at Oregon State University, but continued to help firefighters as I contracted with the local fire department to provide annual fitness assessments and educational lectures for their members. I also dedicated all of my research at Oregon State to firefighter health. 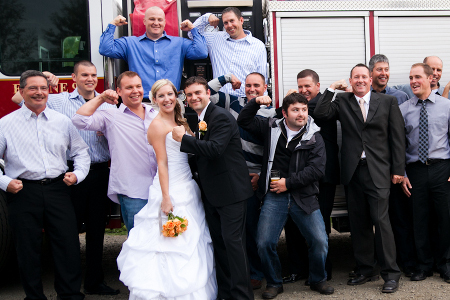 And in 2011, I married a Corvallis firefighter. By the start of 2012 I was conducting fitness assessments and providing health classes to three fire departments in northern Oregon. Through this work, and my own research, I learned a great deal about the physical demands of firefighting and I developed a goal to help lower the alarmingly high incidence of injuries and cardiovascular events in this sector. As a scholar and scientist, I believe the greatest tool to accomplish such a goal is education; I thrive on helping firefighters understand how their behaviors affect their risk on the job, and how, specifically, they can lower that risk. After three years of running a local business I began to dream about the possibility of helping firefighters who aren’t within my physical reach. Thus, this website was born. I get to use my skills as a researcher, writer, and speaker and interact with my favorite people. I get to help firefighters improve their quality of life for the job and for retirement. I get to help departments save money, be more efficient and ensure that everybody goes home. I am committed to providing clear and pertinent health information that can change peoples’ lives. My work has been featured in Fire Engineering, FireRescue1 and many other fire service publications. So make sure you’ve signed up below to get free health tips and information about my upcoming online trainings.